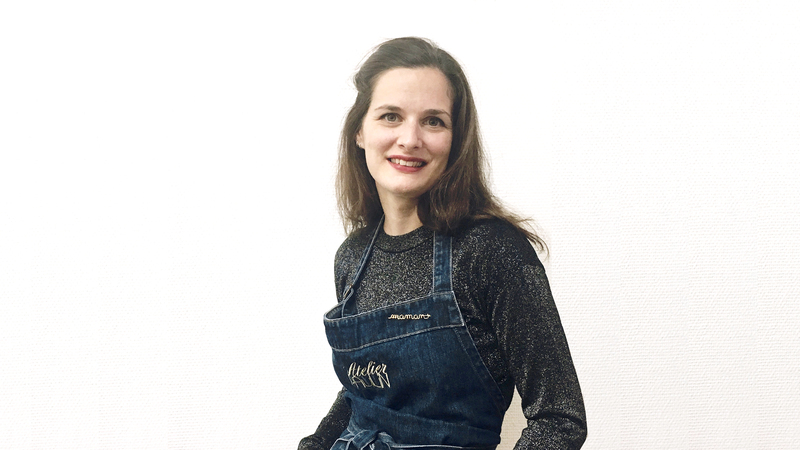 Meet the lovely Maïna, one of our 22 artisans! How did you land in the jewelry? A jewelry stick to my skin since I learned to coordinate my movements as a baby! As far as my memories go, I have always had! After got my diploma of History of Art and Archeology, my little hands needed an activity more than on paper in the university library. I hesitated between jewelry and stained glass because these two fields allowed me to bridge my favorite subjects: medieval archeology and the history of art. I believed that I had therefore found my way to jewelry by enrolling at the jewelry school in Paris. How does being a mom affect your career? When someone becomes a parent and becomes responsible for another life than their's own. It's even dizzying at first! That's why I made a choice to stay with my eldest before considering to return to a work life. I felt my desire to return to work after I learnt that Atelier Paulin wanted to built a team of artisans in the end of 2016. Seduced by the history of the brand and product, I met Anne-Sophie and Matthias. I was fortunate to find people who are understanding and open to the idea of ​​working with a young and future mom because I was expecting my 2nd child.We had agreed that I would get back after the end of holidays, and I would go back to work a few months after the baby was born. I was so excited when Pauline, the chef of atelier , contacted me and offered the position of brand manager at Bon Marché. I could not refuse such an opportunity, especially since I had been very much attached to the teams. i knew that i was not going to be easy . it's been 3 months since I joined Atelier Paulin full time and the pace was easily and quickly set up. I am convinced that things were done so smoothly. My baby also knows the offices because I was able to come work with him while I was still breastfeeding exclusively: a smooth transition for him as for me. How to maintain your passion with jewelery? Working with precious metal has always fascinated me more than a precious stones and also It's fascinating to see all the steps necessary to make a jewelry from a few grams of precious metal! PRECISION and passion without hesitation! What I like most about working at Atelier Paulin is the meeting with customers. They come to ask us to make a custom jewel by giving us a share of their privacy. This meeting is relatively fast, but most often, it is charged with emotions. A declaration, a birth, a maxim ... it is up to us artisans, to retranscribe it to the height of its value. This beautiful young woman, unfortunately seriously ill, who asks me in one winter evening to make the word CONFIDENCE. Paulin workshop in one word?